Tomboy is a desktop note-taking application for Linux, Unix, Windows, and Mac OS X. Simple and easy to use, but with potential to help you organize the ideas and information you deal with every day.The key to Tomboy’s usefulness lies in the ability to relate notes and ideas together. You can access your notes by just click on the Tomboy Panel applet, which is always visible on your desktop. You can choose one of the notes you have recently viewed from the menu or search for older notes.The Table of Contents lists all your notes in the order they were last modified.No more moving your applications to find a website you dragged to the desktop, No more searching your filesystem to find where you think you maybe put last week’s to-do list. Using a WikiWiki-like linking system, organizing ideas is as simple as typing a name. Branching an idea off is easy as pressing the Link button and links between your ideas would not break, even when renaming and reorganizing them. Tomboy supports many advanced editing features, but they would not bother you until you need them.It is a top priority for Tomboy to be able to handle all the sorts of information you want to keep track of. Canonical and the Ubuntu developers have released the first beta for version 11.10 of their Linux distribution, code-named “Oneiric Ocelot”. According to the Oneiric Release Schedule, Ubuntu 11.10 Beta 1 will be followed by a second beta on 22 September; the final version is to be released on 13 October. it improves on the big changes made in 11.04, by cleaning up the Dash, overhauling the Ubuntu Software Center, and bringing in some new default software. The first beta of Ubuntu 11.10 includes the 3.0.0-9.15 Ubuntu-customised Linux kernel, which is based on the stable Linux 3.0.3 release. An updated and improved Unity desktop interface is also included, with components from GNOME 3.1.5, an unstable pre-release build of GNOME 3.2, providing services beneath the desktop shell . The developers note that the “Places” functionality has been renamed “Lenses” to reflect a wider scope of use. Lenses can now display information from multiple sources, such as files, music collections or social networks, as well as allowing them to be filtered on fields such as ratings, ranges and categories. For example, theBanshee music player (version 2.1.3) includes a new default music lens. The beta of Firefox 7 is included and Thunderbird 7 beta is now the default email client with menu and launcher integration; stable versions arescheduled for release on 27 September. As with all development releases, use in production environments and on mission critical systems is not advised. Users testing the release are encouraged to provide feedback and report any bugs that they find. The latest stable release is Ubuntu 11.04 “Natty Narwhal“, while the current Long Term Support (LTS) version is Ubuntu 10.04.3 LTS. Ubuntu is sponsored by UK-basedCanonical Ltd. If u like proprietary video and audio codecs. Be that as it may, some sites, like NBC’s Olympics site, Use Microsoft’s proprietary Silverlight streaming technology with linux. Until recently, if you were using Linux that meant you couldn’t watch videos from these sites at all. 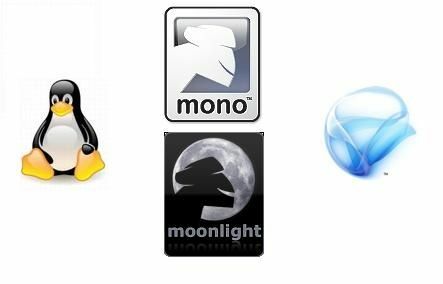 Until now The Mono Project, a Novell sponsored open-source initiative to bring .NET code to Linux, has just released an open-source, Firefox add-in Moonlight 1.0 that enables Linux desktop users to view Moonlight content. At boot-up, Mi users are greeted with a screen presenting a Web search engine; a list of favorite Web sites; shortcuts to their music and photos; a settings manager; and a Start New Program button. If you click on the button, you’ll get separate tabs for Internet, Media, Utilities, Work, Play, and “All” applications. Because the OS is based on the Hardy Herring edition of Ubuntu, it should be able to run just about any Ubuntu app.